Two tone rope effect sterling silver pendant. 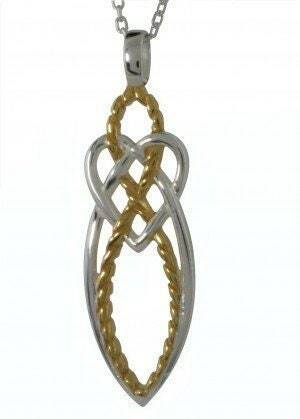 This artisan celtic knotwork incorporates the symbol of a heart to show love. Celtic knots are perhaps one of the best recognized symbols of Irish heritage. Their unbroken lines weave over and under symbolizing everlasting love and everlasting life. They are inspired by the beautiful and very colorful drawings that decorate the Gospels in the Book of Kells.